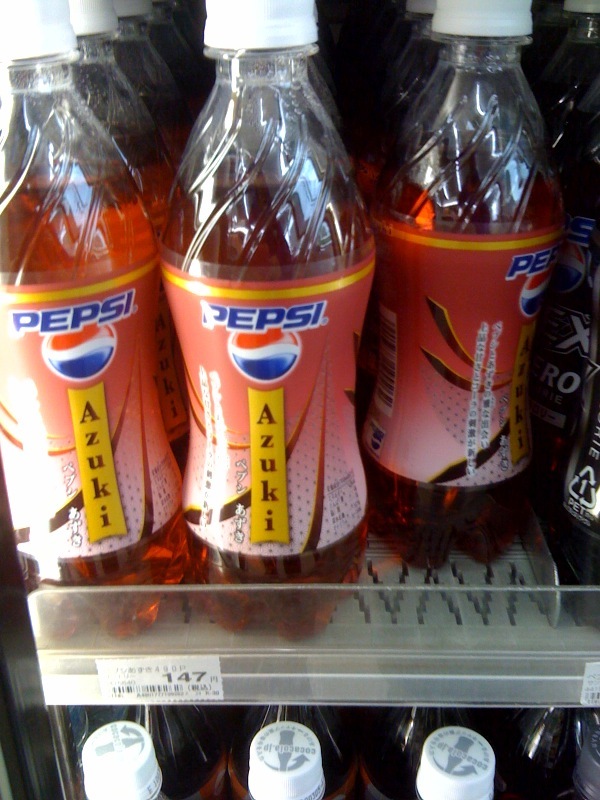 But now the Pepsi company has combined the azuki bean flavor with their cola and the result seems to be less than stellar. In previous seasons Pepsi has combined cola with shiso (a green leaf) and cucumber. Those seem almost normal in comparison. The azuki was supposed to have been seasonal through the autumn, but it is still available widely in stores and it’s already January. True confessions: I read so many horrible reviews of the product that I don’t even want to spend the 150JPY (about $1.75) to buy a bottle. Some have said that the initial smell upon opening the bottle is akin to day-old trash. Some have said that the flavor is biting. The mildest review that I read called the product “not offensive” and that the bean taste is mostly in the aftertaste. Japanese love combinations so this shouldn’t be a surprise. But still, some things are not meant to be combined. Enjoy the photo of the bottle anyway!